Officials are worried the European green crabs could damage commercial shellfish beds in Puget Sound. 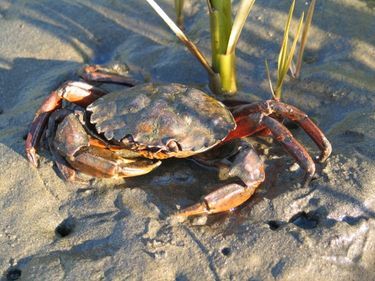 BREMERTON — Officials in Washington state say an invasion of the European green crabs that could disrupt the Puget Sound ecosystem is continuing. Biologists with Washington Sea Grant tell the Kitsap Sun that 16 of the crabs have been caught this spring at one location on Dungeness Spit near Sequim on the Olympic Peninsula. The group coordinates volunteers who place crab traps to locate populations of the green crabs and then additional traps to thin their populations if any are found. Officials are worried the crabs could damage commercial shellfish beds in Puget Sound. The invasive species has been blamed for the collapse of the soft-shell clam industry in parts of Maine. The crab was discovered in late August in Westcott Bay, San Juan Island.